Tony Blair is the victim of a left wing plot to oust him as prime minister, Home Secretary John Reid has said. About 50 Labour MPs are thought to have signed a letter calling for Mr Blair to name a departure date to end "debilitating" leadership speculation. But Mr Reid claimed their real agenda was to topple Mr Blair and turn the clock back on his reforms. 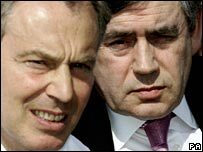 It comes as Chancellor Gordon Brown calls for an "orderly" handover of power when Mr Blair steps down. Mr Reid, who took over as home secretary from Charles Clarke in Friday's sweeping Cabinet reshuffle, backed Mr Brown's call for party unity but said he would "go further". He said Mr Blair should serve a full third term, as he had promised the electorate at last year's general election. Getting rid of the prime minister now would be "catastrophic" for Labour, he added. Meanwhile, a survey for BBC Radio 4's The World This Weekend suggests backbench Labour MPs are deeply divided about Mr Blair's future. The survey found 52 MPs believe he should leave office within the next 12 months, while 29 MPs think he should stay as prime minister as long as he likes. Labour MPs need 70 signatures to trigger a leadership contest. Mr Brown's inner circle have distanced themselves from the backbench letter calling for Blair's departure but it is not thought to be the work of the prime minister's traditional critics on the far left of the party either. Neal Lawson, of the left-leaning pressure group Compass, said by Mr Reid to be behind it, has repeatedly called on Mr Blair to step down in favour of Mr Brown. Mr Lawson, a former aide to Mr Brown, told the BBC: "What we need is a change of direction, and if a new leader is elected at the last minute like Tony Blair wants, there won't be time to change the party's direction." Former minister Angela Eagle is on Compass's board and the group also has links to former ministers John Denham, who quit the government over Iraq, and Nick Raynsford, both of whom campaigned against Mr Blair's education reforms. They were not available for comment on Sunday. Mr Reid said announcing a timetable for Mr Blair's departure would hand the Conservatives a "big advantage", furthering the cause of those in the Labour party who wanted to halt reform. Analysis: Time up for Blair? "The whole thing has been generated by people who want to push Mr Blair out. They want to stop the reform programme and go back to Old Labour," Mr Reid told the BBC's The Politics Show. "They're not going to win. There is no going back for this party." Mr Brown said Labour's local election results had been a "wake up call" and the party had to change to win back voters. But he said a coup against Mr Blair would be a "recipe for disaster". "I have been in politics long enough and I have seen throughout the past 25 years when the Labour party divides and extremists take over, and the moderates lose control, that is a recipe for disaster. "People want unity. They want politicians like myself to show that we can move things forward, but in a unified way." The chancellor said Mr Blair's departure date was a matter for him but the prime minister was talking to people about it and he did not need "outriders dictating the agenda". Meanwhile, in a further sign of a backlash against Mr Blair's Cabinet reshuffle, it has emerged a health minister has quit over NHS reforms. It was initially thought Jane Kennedy had been sacked in Mr Blair's reshuffle but she told the Observer she quit due to concern about the impact on her local children's hospital of the changes. She also felt she was not free to express her opinions, she told the newspaper. Former minister Frank Dobson said he knew many voters who would not back Labour with Mr Blair in charge. "So long as Tony Blair remains prime minister, the Labour Party's position will not recover," he told BBC Breakfast. Conservative Shadow Chancellor George Osborne said rows over Mr Blair's departure and Thursday's local election results showed Labour was now in "near terminal decline". The letter being circulated among Labour MPs says the party's record in office was being overshadowed by "debilitating speculation over the future leadership and direction of our Party". "A pre-requisite of any orderly democratic change is a clear timetable and transparent procedures," the letter said. The issue will be discussed at a meeting of the Parliamentary Labour party on Monday.